The U.S. military has announced a new mission in northern Syria aimed at reducing tensions between Turkey and America's Kurdish partners. Defense Secretary James Mattis told reporters on Wednesday that the U.S. will be building observation outposts in northern Syria along the Turkish border, because the U.S. wants to "call the Turks and warn them if we see something coming out of an area we're operating in." That "something" is Kurdish fighters who belong to a force that Turkey considers to be an element of an insurgent group. But some of those Kurdish fighters also serve in what's known as the Syrian Democratic Forces, a critical partner for the U.S. in the fight against the Islamic State in Syria. 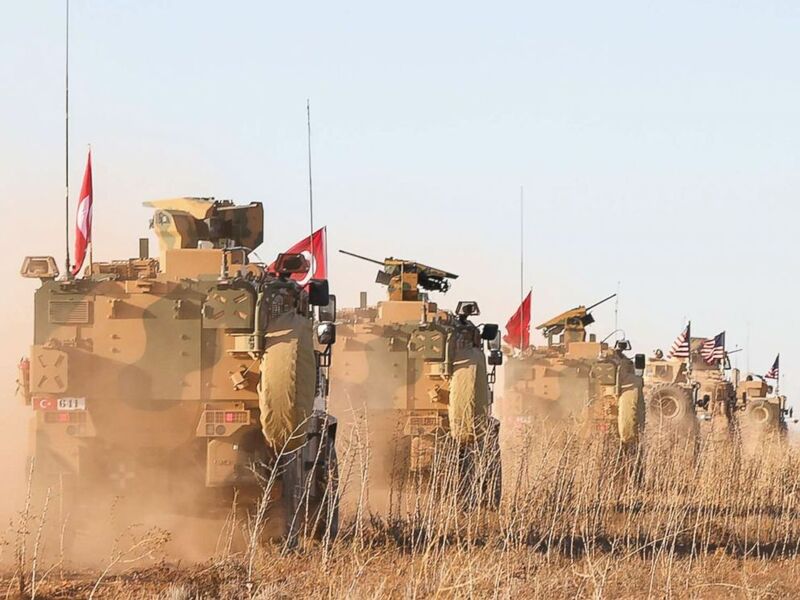 U.S. and Turkish soldiers conduct the first-ever combined joint patrol on Nov. 1, 2018, outside Manbij, Syria. Mattis said that outposts and communication with the Turkish military will be designed to "make sure that the people we have fighting down in the [Middle Euphrates River Valley] are not drawn up that fight." "They [Turkey] have legitimate concerns about terror threats," he told reporters. "We are going to track any threat that we can spot going up into Turkey." The move is another sign of increased cooperation between the U.S. and its NATO ally. After Turkey threatened to send troops into Manbij to push out Kurdish forces, the U.S. and Turkey agreed to conduct combined joint patrols of the northeastern Syrian city. Following months of training, those joint patrols began earlier this month. The new mission will not require additional American troops in Syria, Mattis said. The U.S. currently has approximately 2,000 troops fighting ISIS in Syria.